I am sure that many of you, dear fellow readers, consider the red color as the color of passion and romance. However, when the snowy winter comes, red is surely the color of Christmas. The red Christmas decoration is cheery and vibrant and makes a great contrast with the snow outside. It is traditionally used in candy-striped patterns, either fresh or faux red berries, or on the shimmering tree ornaments. But that’s not it! 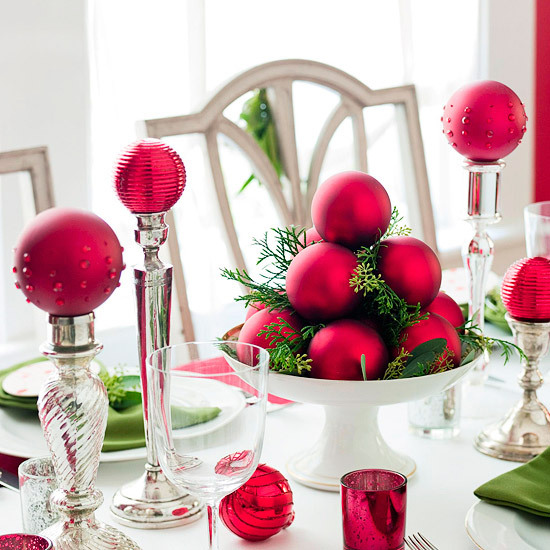 You can add some reddish twists to your festive decor so everyone will envy you. 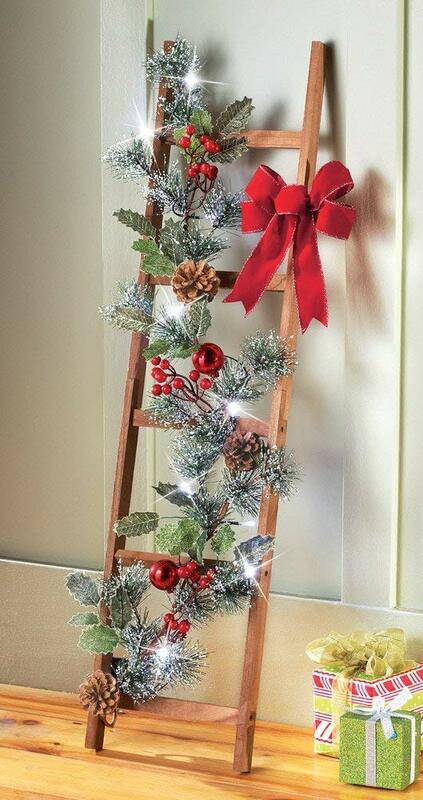 This wooden ladder, decorated with a removable garland made of faux holly berry leaves and Christmas lights, could become the centerpiece in your holiday living room space. 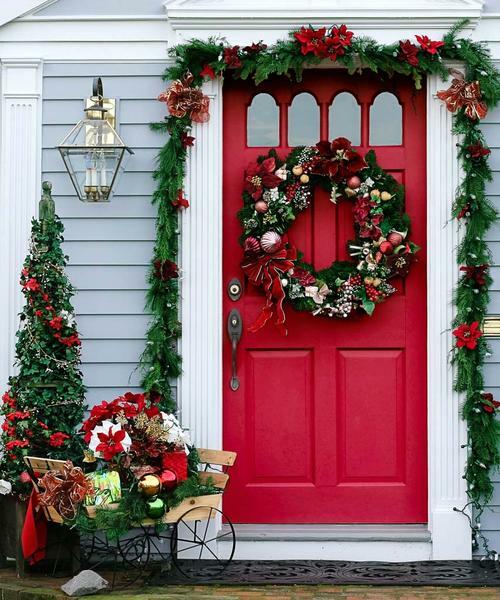 As part of your red Christmas decoration, It looks very traditional, cheery, and it’s a real space-saver! 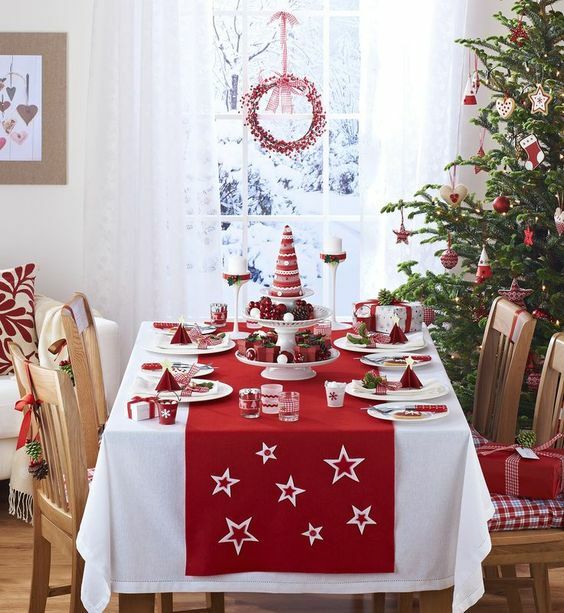 This year, instead of using the heavy pretentious tablecloth, why don’t you cover the dining table with a couple of identical strips in red and white? This won’t steal the attention from your beautiful festive dining table decoration, but at the same time will create a mood. 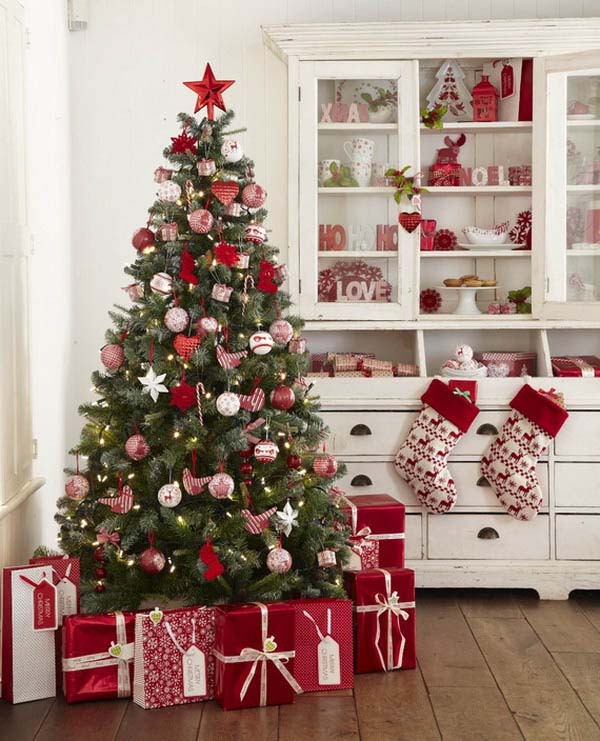 Here is something for the fans of the red and white Christmas decorations ideas! If you want to create a mood in your Christmas home, take out a whole cupboard on which to create a real Christmas scenery. Arrange beautiful cards, decorative packed gifts, paper figurines, colorful Christmas tree balls, and other ornaments. All items, including the cupboard itself, should be in white, green and red. I simply love the contrast between the elegant snowy-white tablecloth, the green tissues, and the cheery red Christmas decorations. This contemporary festive table setting is very eye-catching and makes a strong statement, however, it does not lose the traditional holiday vibe. 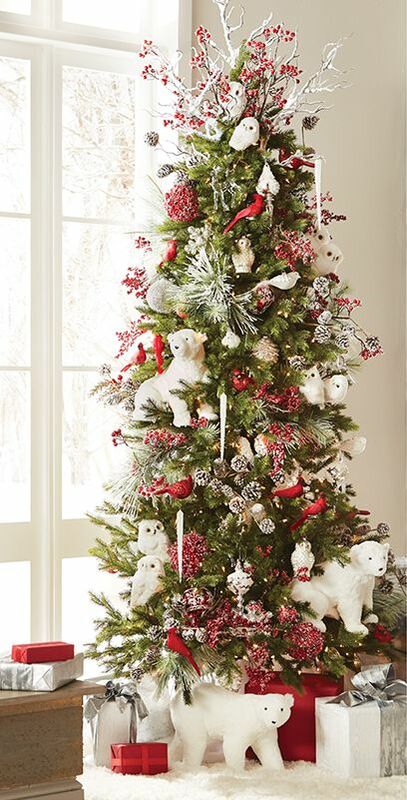 This large sized faux frosted Christmas tree is decorated with beautiful red and gold ornaments in all sizes, and it is something I just cannot keep our eyes off. 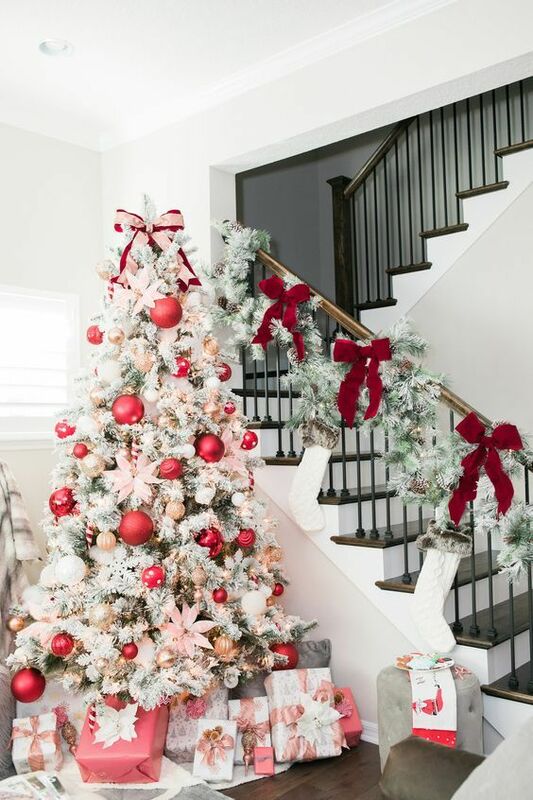 The large ribbon as a unique tree topper and the beautifully decorated presents go well with the overall decoration. 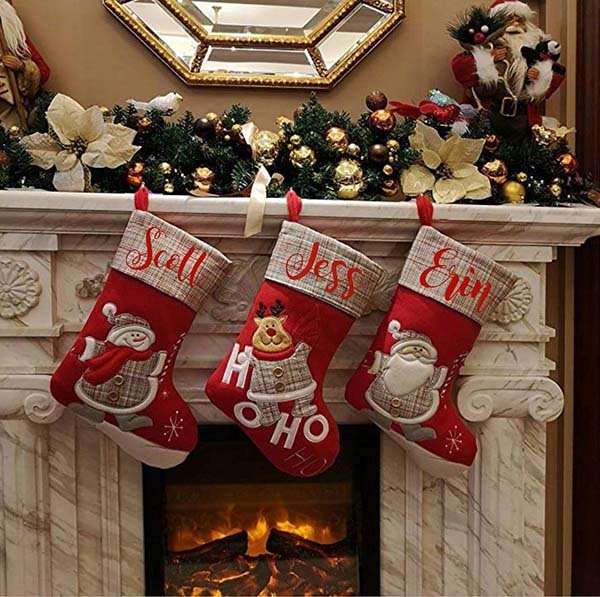 If you’re looking for some red and white Christmas decorations that you little kids would like, consider displaying a set of three (or more) personalized stockings on the Christmas fireplace mantel. They are a timeless element of the every traditional Christmas decoration. Plus, they bring a lively fun vibe to space. 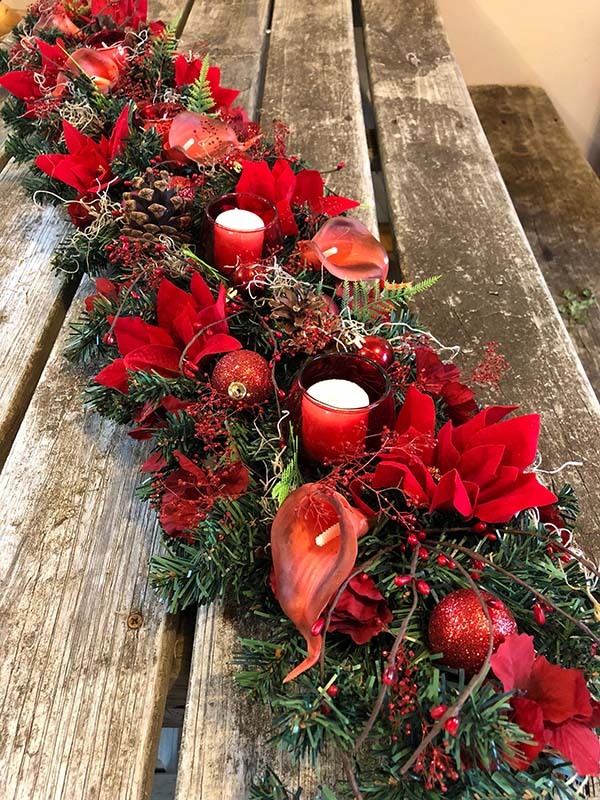 Here is how you can easily create a stunning rustic holiday table centerpiece from a simple garland decorated with faux flowers and greenery (that actually look very natural). If you love the red and white Christmas decorations ideas, you can try to re-create this beautiful natural Scandinavian style sign and display it around the Christmas tree. When we decorate the tree, we should not necessarily use only Christmas balls. 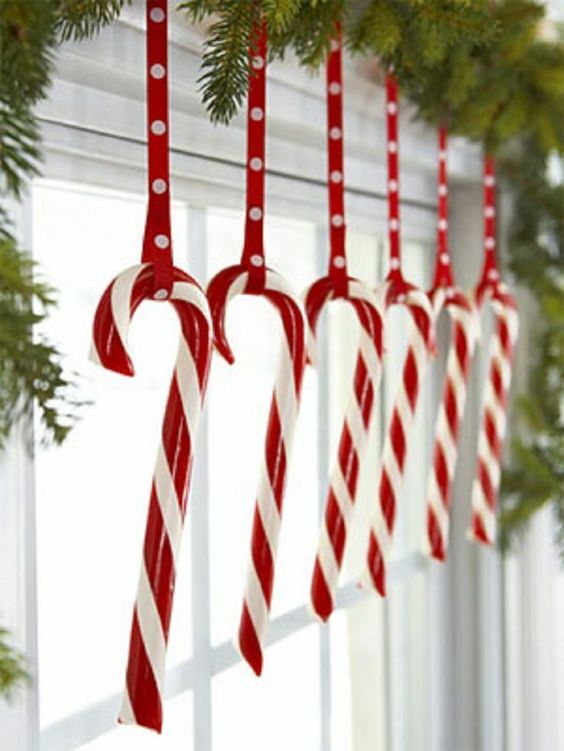 Hanging candy canes on the windows combined with evergreens, really emphasize the Christmas look. 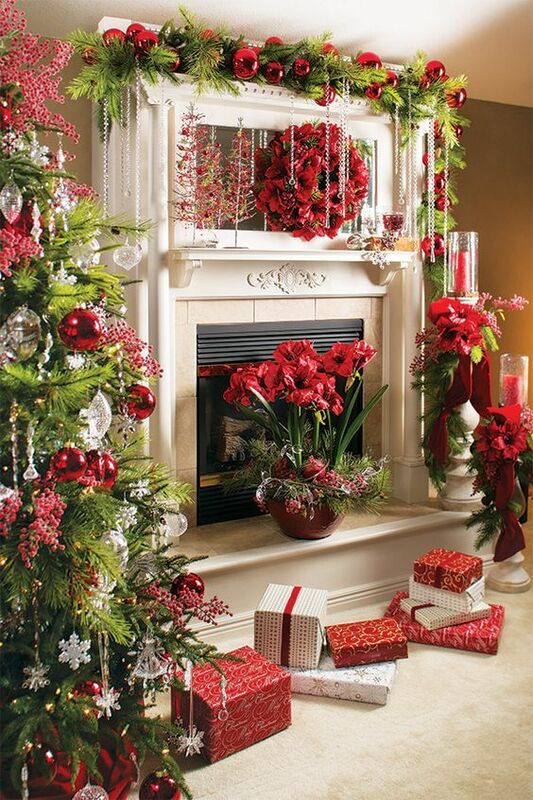 The combination of red and green Christmas decorations surely brings a strong festive vibe to every home. 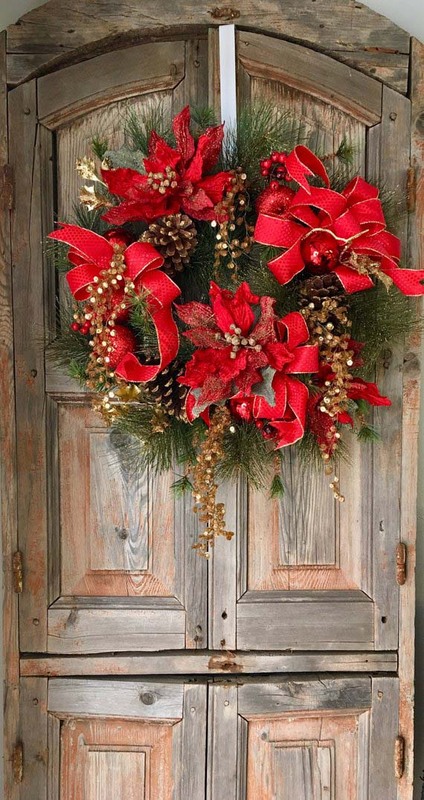 Displaying a large wreath on the Christmas front door, made of artificial greenery and red balls and ribbons make your house more welcoming and cheerful. 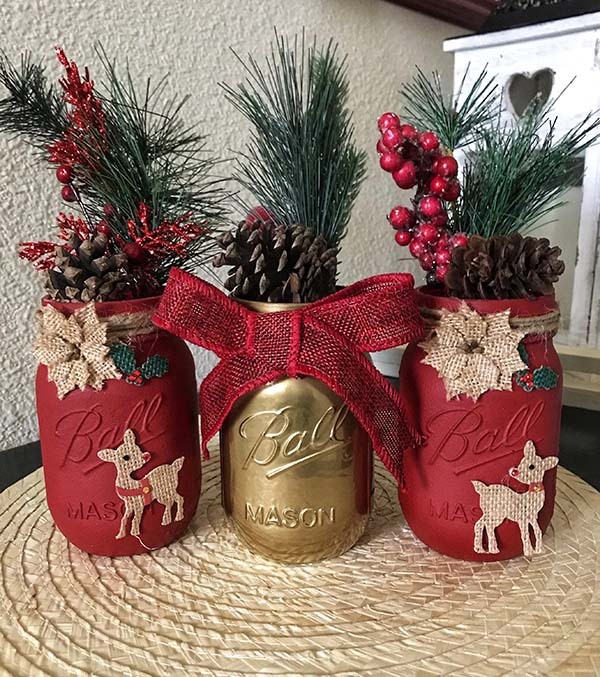 This set of 3 elegant Christmas Mason jars, hand-painted with premium chalk paint and a gold metallic spray paint, can be a perfect addition to every mantel’s red and gold Christmas decorations. 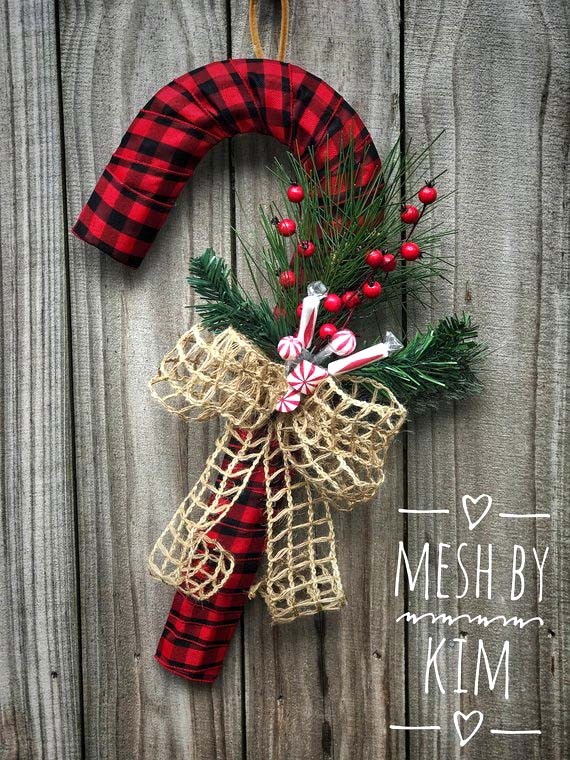 Love the accent with burlap ribbon, reindeer, burlap bows, and twine. 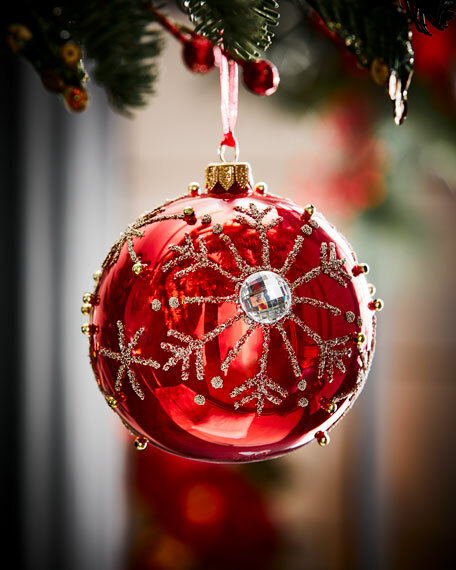 This red opal glass ball decorated with silver snowflakes is a great red Christmas decoration for a home with a more contemporary and luxurious design. It gives glamour and showiness to the festive tree and at the same time brings a traditional vibe. 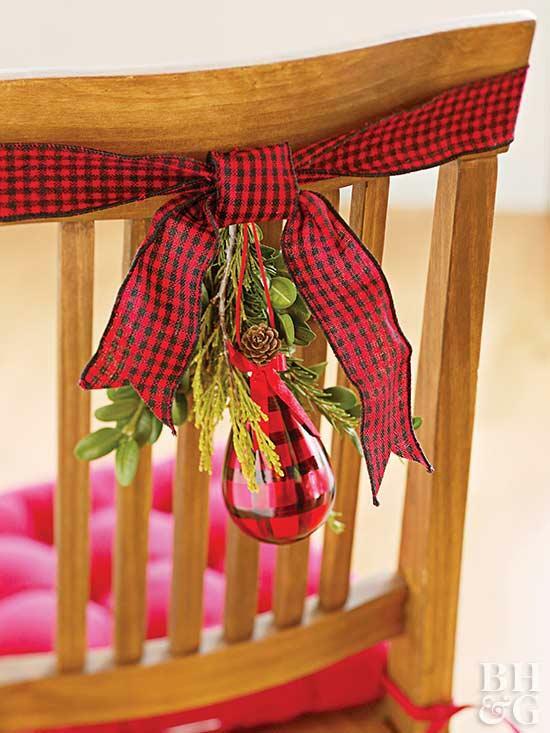 Take a look at the details – the faux peppermint candies, the faux cranberries, and the window pane bow. 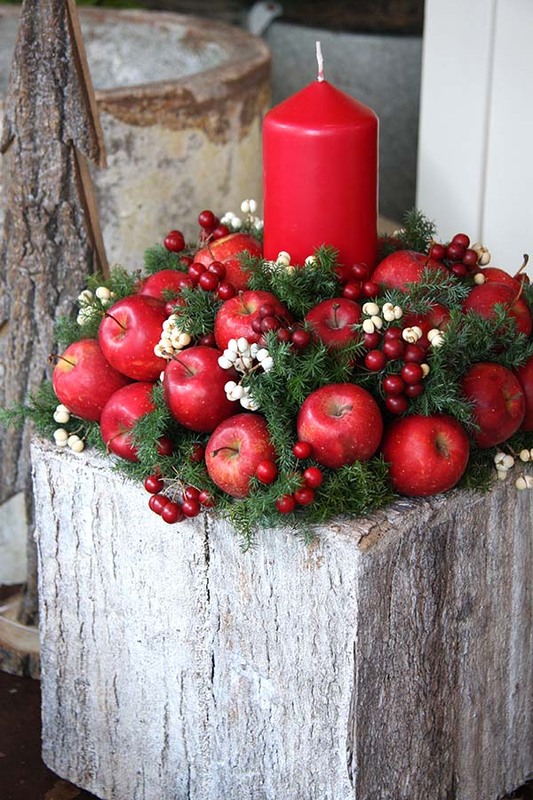 Looking for a rustic glam while creating your red Christmas decoration? I’ve got something for you then! This stunning DIY red and gold wreath is catching the eye with dusted pine branches, shimmering pine cones, artificial cranberries, and red glitter apples. If you prefer the simple, unpretentious red Christmas decoration, this beautiful setting could be the right answer for you! In case you’re not using the fireplace this winter, try to use it as a spot to display your beautiful red and green Christmas decorations. Use the space above the mantel and in front of the fireplace to give the living room space additional texture and height. 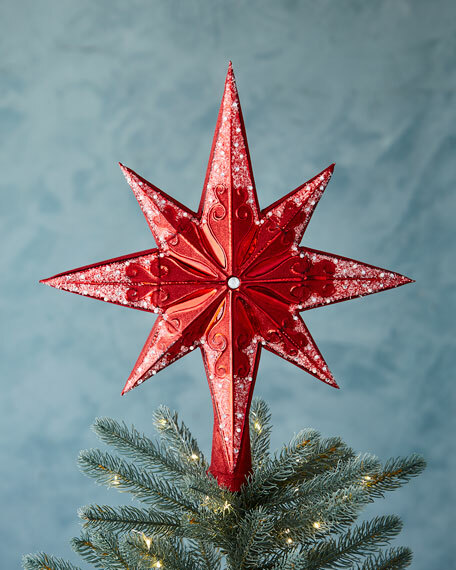 This appealing red star, decorated with sparkling glitter, adds the perfect finishing touch to any Christmas tree. Hint: Before buying one of these, make sure it has a double-sided design so your tree will catch the eyes from every angle. If you’ll host a festive dinner this year, do not focus on decorating only the dinner table but also the chairs. No need of an expensive pretentious red Christmas decoration. It could be something cute, cheery that compliments the table decor (such as the one on the picture).